Joe Thorn, showing off his Christian liberty. Because he is cool, man. He’s cool. Tatting up his knuckles with “1689,” the year of the Second London Baptist Confession of Faith, Joe Thorn cemented himself as the token representative of old-school Reformed Baptists for a new generation. 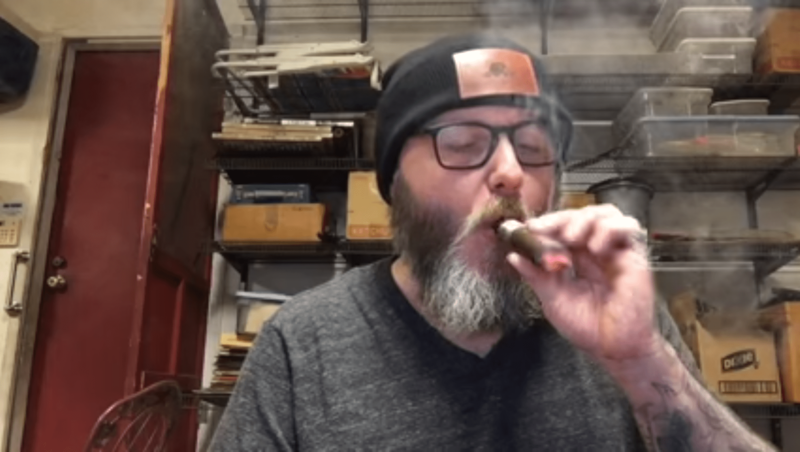 The bearded hipster, who advertises his cigar and alcohol choices like George Whitefield proclaimed the Gospel, is popular among New Calvinists, the large subset of the faux-Reformed subculture of American evangelicalism. Proclaiming the gospel of coolness, many New Calvinists are carried to and fro not only on winds of doctrine but by the spirits of the age. And no group has been more susceptible to the Social Gospel blitzkrieg in recent years than the younger, hipper, more bearded, slightly less-sober anti-Bereans known as the Young, Restless and Reformed. “The Legacy” is a group that primarily holds to two core tenets; the first are the Five Solas of the Reformation and the second is Racial Consciousness. Far from desiring to view all people independently of their ethnicity, The Legacy acts outside the color-blind legacy of Dr. Martin Luther King, and instead operates squarely inside the plantation of Critical Race Theory. Pulpit & Pen already brought to you the story of The Legacy hosting an event for women-of-color only at an upcoming The Gospel Coalition conference. By the time you are explicitly rejecting white women from your conference get-togethers, you have well-surpassed the Cultural Marxism milestone. Instead of integration, The Legacy promotes segregation, and ironically in the name of racial unity. The Legacy website is replete with the explicit terminology of Cultural Marxism and Critical Race Theory. While claiming to uphold “biblical manhood and womanhood,” the conference will host a plethora of female pastors and will have women preaching to men. One can only expect their commitment to the Solas are as strong as they are to complementarianism. There’s even a time period set aside at the conference for “story-telling,” which is a core tenet of Critical Race Theory (instead of demonstrating factually that minority groups are victims with statistics or empirical evidence, they tell anecdotal stories and personal experiences). Speakers include Cultural Marxists heavily involved in the Martin Luther King veneration conference, MLK50, including Voddie Baucham’s son-in-law and daughter, Phillip and Jasmine Holmes, whose Twitter and social media feeds read like what it would look like if the Huffington Post and Malcolm X started a blogging project together (for those wondering, there is no indication that Baucham himself has anything to do with this organization or approves of his family members’ involvement, and every indication that he is as fervently against race-baiting as much as he’s always been). Kyle J. Howard, who is afraid to be left alone with theologian and apologist, James White. Also speaking at the conference is Kyle J. Howard, the community organizer and as a “racial trauma counselor” who has become an Agent of Influence (also known as a Change Agent) in the Southern Baptist Convention’s flagship seminary. Most recently, Howard has claimed that using the term “Marxism” is just another way to use the “n-word.” Howard, pictured to the left with fellow Social Justice Warrior (SJW), Beth Moore, first became noticeable by criticizing James White of Alpha and Omega Ministries. Howard, who without credibility claims to have been in the Crips gang (Howard was raised in a mixed-ethnicity, upper-class household by two parents who were attorneys in an affluent Atlanta suburb), said that he would be “afraid of being alone” with James White, implying that White would seek to harm him. White’s microaggression toward Howard was, apparently, questioning the place of the Social Gospel at the MLK50 event. According to Howard, questioning the Social Gospel was ostensibly racist. Howard will be speaking, according to his social media page, on the topic of racial trauma. As we have previously explained, Howard has been promoting textbook Critical Race Theory at SBTS and beyond. Coming out of nowhere, having previously served as a community organizer and racial advocate, Howard has appeared with a significant social media presence with dubious and nebulous financial backing. But even more troubling than the Holmes’ Social Gospel power couple and Kyle J. Howard, speaking at the conference as a major headliner is Soong-Chan Rah. Soong-Chan is a major link in the rise of Cultural Marxism among evangelicals and has aligned himself heavily with men like leftist-progressive Jim Wallis of Sojourners. Soong-Chan is, according to Sojourners, formerly the founding senior pastor of the Cambridge Community Fellowship Church (CCFC)—a multiethnic, urban ministry-focused church committed to living out the values of racial reconciliation and social justice in the urban context. Soong-Chan has previously been part of a church planting team in the Washington, D.C. area, worked for a number of years with InterVarsity Christian Fellowship in Boston (specifically at MIT), and mobilized CCFC to plant two additional churches. He currently serves on the boards of World Vision, Sojourners, the Christian Community Development Association (CCDA), and the Catalyst Leadership Center. The Christian Community Development Association serves on the Evangelical Immigration Table, a George Soros-funded organization, on which also serve Jim Wallis, Russell Moore, Matt Chandler, and other New Calvinist leaders who are going all-in for Rauschenbuschism. We should expect men like Kyle J. Howard or Phillip Holmes to take part in this Cultural Marxism, Intersectionality, Critical Race Theory and Racial Segregation event. We should not expect men with 1689 tattooed across their knuckles to take part in such an event. Speaking at The Legacy Chicago 2018 is the aforementioned pseudo-Reformed Baptist, Joe Thorn. But then again, when so much of your personal image is related to cultural relevance, you are bound to be carried about on the tide of popular fads and the blowing winds of ideological compromise. For those of us whose Reformed Theology runs deeper than ink drawn into our epidermis like a child who never learned that crayons were only for paper, we understand that God’s chosen nation (1 Peter 2:9) includes people from every tribe, tongue, and nation being brought into one people group (Revelation 7:9). Those of us who hold to Covenant Theology understand that there are only two races of people; those belonging to Christ and those belonging to Adam (1 Corinthians 15:22) and that ethnicity is truly no deeper than Joe Thorn’s knuckle tats. For those of us with a Biblical worldview, we understand that the key to ethnic consciousness, is by color-blindness without regard to ethnicity (Galatians 3:28, Colossians 3:11).